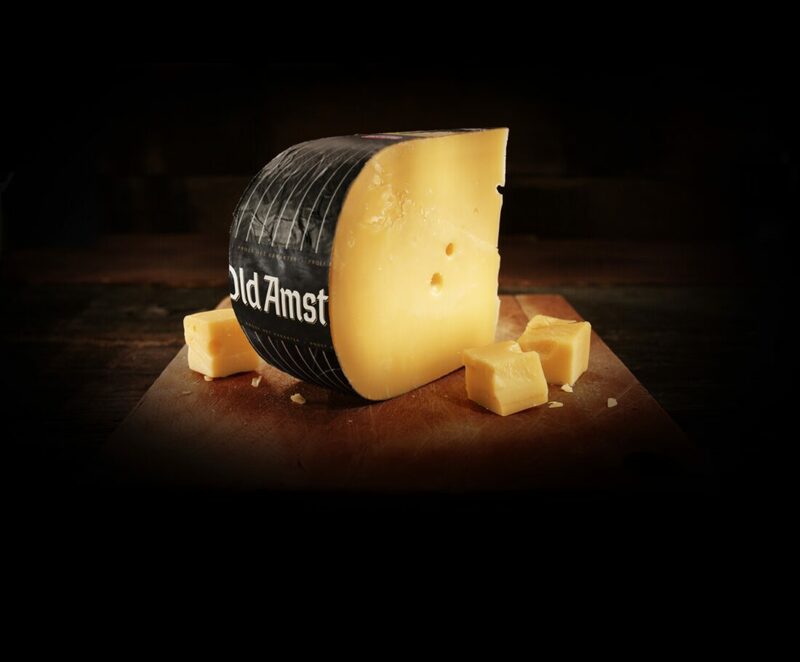 Old Amsterdam is a premium aged cheese with a mild sweetness. It is rich in maturation crystals but is still easy to slice. This cheese, named after the most liberal city in the world, represents pure pleasure. With its own unique recipe, it has received numerous accolades from around the world, and deservedly so! There is cheese, and then there is Old Amsterdam. In the 1980s, the conservative cheese landscape of the Netherlands gradually began to diversify, and full-flavoured cheeses increased in popularity. Unfortunately for the connoisseurs, the quality of mature cheese varied considerably in those days. It was often crumbly, and the rind was so hard that cutting the cheese often resulted in bleeding fingers. In 1985, the Westland family consequently had the desire to develop a mature cheese that is still easy to slice even though it contains the characteristic maturation crystals. With several years of experience in the door-to-door sale of cheese, the family knew exactly what makes a cheese popular. They also knew that the manufacturing process to be developed for Old Amsterdam had to guarantee consistent quality. There is no other city on earth like Amsterdam. Amsterdammers like to work hard and play hard, and the liberal attitudes and commercial spirit of the Dutch Golden Age have been instilled in the people of the city for centuries. That enterprise, individuality and pride appealed to the Westland family. When they started out as cheesemakers, they let their cheeses age in the centre of Amsterdam, in a building on the Lijnbaansgracht. The rich contrasts in the character of the city and its inhabitants captured the hearts of the family in those early days and also permeate the character of Old Amsterdam cheese. Old Amsterdam is made from Dutch free range milk. To this we add rennet and lactic acid to activate the cheesemaking process. The lactic acid gives the cheese its unique flavour. The developers of Westland cheese had to experiment for a long time before they found the ideal composition for the Old Amsterdam lactic acid. Eventually the perfect mixture of natural ingredients was found in the lactic acid named Melkbak 4, or M4. Today our M4 lactic acid is still the best kept secret in cheesemaking. The answer to the question of how to make a mature cheese that is still smooth and creamy was found in Italy, where cheese farmers have been making sliceable crystallised cheeses for generations. The Italian secret lies in the whey, which is the liquid component of milk. During the cheesemaking process the whey is separated from the curd, the solid component. The whey has to be collected, cooled down and then reintroduced to the process at a later stage. According to the Italians, this is the moment when the cheese is given its soul. If you focus on the flavour, you may notice a hint of the Parmesan taste in Old Amsterdam. The makers of Westland turned to their Southern European colleagues again for help in developing the aging process for Old Amsterdam. The aging process is very important for cheese as it determines the ultimate flavour and structure. For Old Amsterdam a precise schedule of temperature and humidity changes has been devised. Flavour is always a more important factor than maturation time, but on average Old Amsterdam is aged for around eight months.